Wants & Desires | Well Worn L.L. Bean Duffle | A Continuous Lean. Things I have been lusting after on eBay but will not buy: this old L.L. Bean duffle. 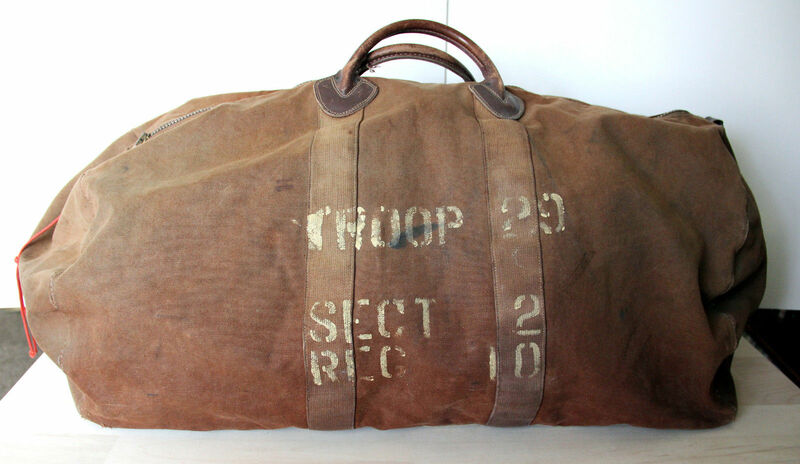 Apparently it is from the 1930s/1940s according to the seller, and judging from the markings of its original owner, the bag was used for scouting and a lot of other scouts had similar bags. All of these L.L. 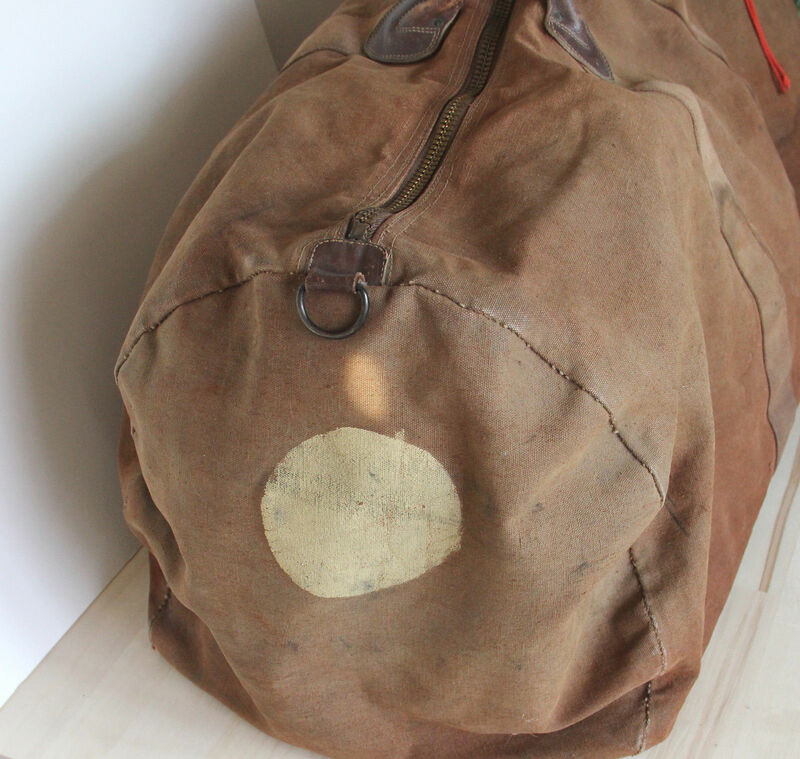 Bean canvas bags have aged so well, they seem to only get better looking with all of those years of wear and tear. For $650, it’s going to make someone else happy, but it’s still interesting to see these old things and enjoy how they look when they grow old. It’s surprising that something this old (if it is real) can last so long? Will the stuff we buy today hold up just as well? That is the eternal question. By the time I am able to take my son (which I haven’t had yet) to the flea market it’s going to be like combing through a garbage dump of race-to-the-botttom cheap clothing. I’m sure the scout that owned this originally could never have expected that his 70+ year old canvas bag that he bought for a buck or two would carry this kind of sticker shock. Though I’m sure in a couple of months we’ll probably see some guy in Japan rocking this in Free & Easy. I’m very surprise eBay hasn’t contacted you to be part of their Curated Series. This item would be so fitting. Absolutely beautiful! A perfect example of something that gets better with age. It’s mighty expensive though isn’t it, to come to the conclusion it’s worth $650 is crazy but if someone out there is willing to pay it then so be it. I’m not being negative it’s just a very interesting market. I have a collection of LL Bean items with what I call the original signature label. That’s a black label with a cursive LL Bean logo. The quality of construction certainly is high. I think the other reason these older LL Bean items continue to survive is because the styling is the bomb! I think it’s a style that was influenced by the military apparel and accessories we manufactured in abundance for the war effort in the 1940’s. I have an amazing LL Bean winter coat that looks totally GI if it’s zipped up and the hood is on your noggin. But if the jacket is open or the inside of the hood is exposed one sees a vibrant camp blanket plaid liner– the give away that it’s for the consumer market. If you break the coat down to the core ingredients I think there are only three. 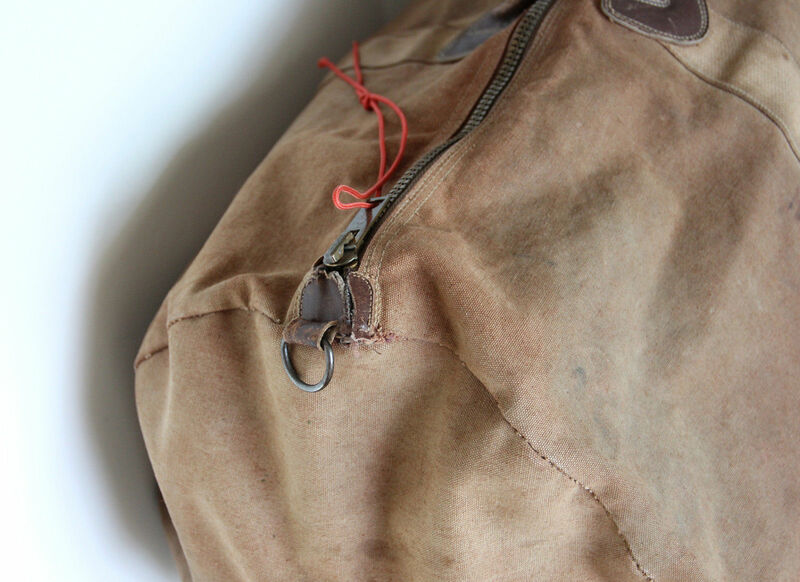 Cotton, wool and metal– Heavy khaki canvas, blanket plaid interior, zipper and snaps. Makes me wonder if at some point decades from now velcro, plastic zippers, polyester fill, and faux fur will be sought after indicators of vintage clothes. Our ladies pay 4-10x more for their designer bags which are way smaller and way less cooler then this fine specimen. At the end of the day this is a conversation piece as well as a piece of history. I fxxking want it! I have a large LL Bean duffle that I bought in while in college (which is approaching 30 years ago). I still take it to my family’s ranch for Thanksgiving. I recently bought a smaller one on ebay a few years ago, and now my 7 year old has inherited the tradition. 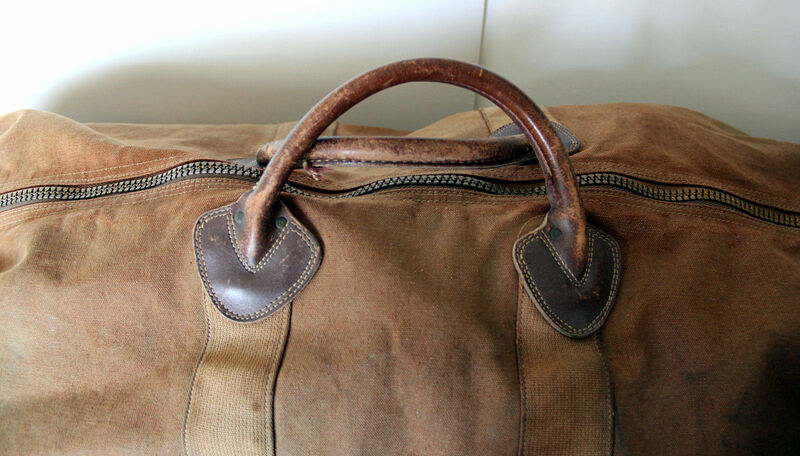 My “vintage” duffle still looks great and always surprised at the values of these on ebay. I’ve actually got that bag (minus the stencils). I know you won’t like to hear this, but I sold a second one just like it at the Elephant’s Trunk and I’m sure I didn’t get more than $125 for it. My point is, there’s another one out there for you. Enjoy the holidays! The bag is indeed black label LL Bean. We have one in our archives. I just sent you an email containing interesting information about it. Please tell me Ebbets is going to make bags in the future. I would also be interested in this information if you don’t mind. Here is the way I think about things like this. The stenciling makes it one-of-a-kind, you will never see this bag again. If you were to buy it you will have no more or no less money a year from now. Things even out. And as Kenyan pointed out, women drop twice that for purses all the time and don’t even blink. Possibly taken to a Jamboree. There are many campsites arranged by section and region, so the stencil would act as an address if it got lost. I have my great grandfathers. Looks very similar but the zipper and handles are broken. Does anyone know if LL Bean will repair them or someone who will? What I find baffling is the fact that these items are so universally accepted as iconic and yet the contemporary LLBean brand feels the need to ‘update’ them with superfluous detail. With so much inherent soul why would you feel the need to reinvent the wheel and then not even execute it half as good? LL Bean items and we enjoy these rare occasions where there is that one person who wants to insure the artifact will carry on for future generations. We are on the same journey! We have this same bag in our archive too so we know the construction well. Send and we will mend! The leather looks great. Do all products made from genuine leather last this long? I read this article a few days ago and this bag looked familiar. I just got home for the holidays and rummaged around in the attic and found a similar bag that belonged to my grandfather. I’d love to find out around what year he bought it. It needs a little cleaning but it is still in great condition. I had this bag! I bought it new around 1970. I think it cost about 21.50 back then. I used it all the time; on a motorcycle, at the airport, hitchhiking, you name it, it was my suitcase. I remember being questioned by a security gal in Frankfurt airport around 1999, “why you dressed so nice but your bag so shabby?” The bag gave up the ghost a year or two after that, handle irreparably torn. I threw it out, then was sort of surprised that L.L. Bean didn’t still offer new ones at slightly higher prices. What is wrong with them? What is wrong with me? What is wrong with people (that they would pay such prices for such old junk)? I keep missing the boat. But I did have a good duffle, once.